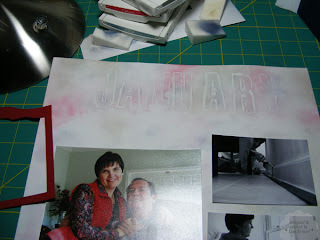 The first I've really known of Project 365 was from last January's Creating Keepsakes Magazine. I'd heard the term batted around the web and then I came upon the magazine from some back issues I ordered off E-bay - a great way to stretch your educational dollars BTW. To participate, you just take at least one photo per day for an entire year. 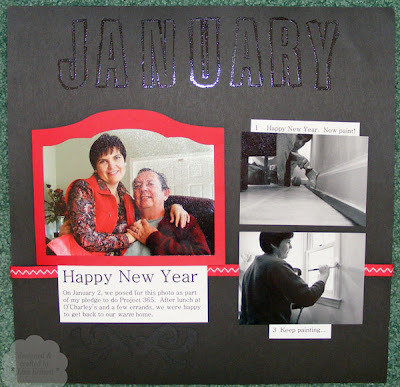 Then you scrapbook the photos by week, month or however you want. I'm doing weeks - Saturday through Friday. That way I can scrap the previous week over a weekend - in theory anyway. This project provides several benefits. It encourages me to take photos of daily life - not just travel or special occasions. I've been doing a lot more of that the last couple of years but I still look for the extraordinary moments and miss how we spend our normal days. 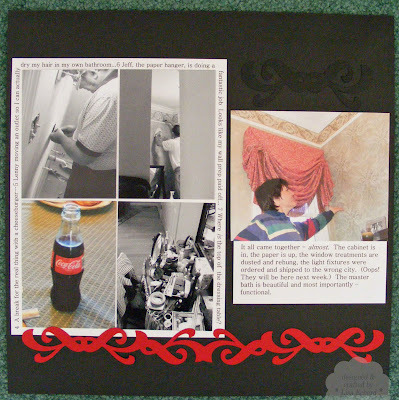 Also, I wanted to experiment with a lot of scrapbooking styles and techniques. I'm not going to have a pattern to my pages other than to capture each week on a page or spread. "Daily life" this week was a little out of the ordinary as we were completing the bulk of our bathroom redecorating project. Most of my photos related to the process plus a couple of other things like going out for the day. I noticed as I took the photos that I had quite a bit of the color red repeating. So I printed out all the photos with red in them in color and turned all the others to black and white. Check off one new technique for me right there. Also, I had an idea how I wanted to arrange the photos which of course got tweaked but it is basically what was in my head. What I didn't plan on were papers. I love designer paper. Sometimes when I'm playing with stamping and inking techniques for cards I think that I ought to just buy more cardstock and do my own background pages. Today I have a whole new appreciation for designer paper and why it works for me. 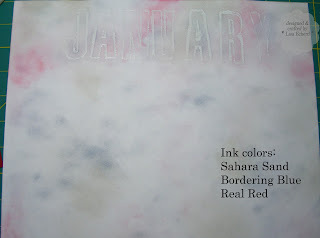 I distressed the paper with 3 SU colors. It's actually pretty. However, it does nothing at all for these photos. The color scheme is too soft. And that red frame I was planning to use on the photo? Forget it. I stared at this a long time before I finally let the idea go. The real irony is that I initially regretted buying wallpaper for our bathroom. I'd spent more than I intended and felt I "should" be able to faux finish the room myself with all the skills I've learned, the tools I have available to me. Well, maybe I could have. But I tell you, just doing 2 12x12 pages of distressing was tedious to me. And my bathroom has about 400 square feet of wall space. If I could hardly get through 2 square feet, where would I have gotten with 400?!! Better use my talents on fabric and paper, leaving walls to the experts. Anyway, sometimes you just have to go in the complete opposite direction. Rather than start with white background paper, I got out some black and was amazed at the difference. (Score another one for something different.) I still wouldn't say this is my favorite layout ever yet it is far closer to the message I was trying to get across for my first week of Project 365 and it lets the photos really tell the story. This is the first that I have heard of Project 365. What a great concept. I love the pictures and pages that you have created.